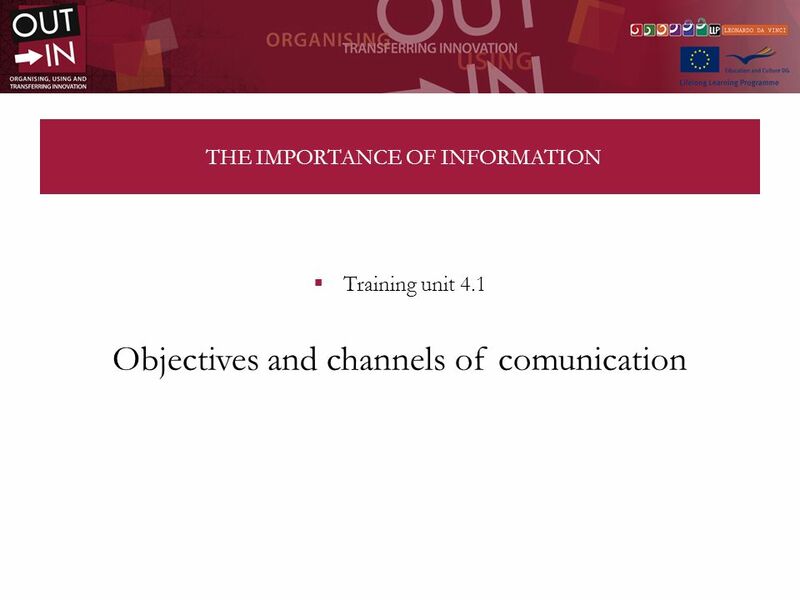 THE IMPORTANCE OF INFORMATION Training unit 4.1 Objectives and channels of comunication. 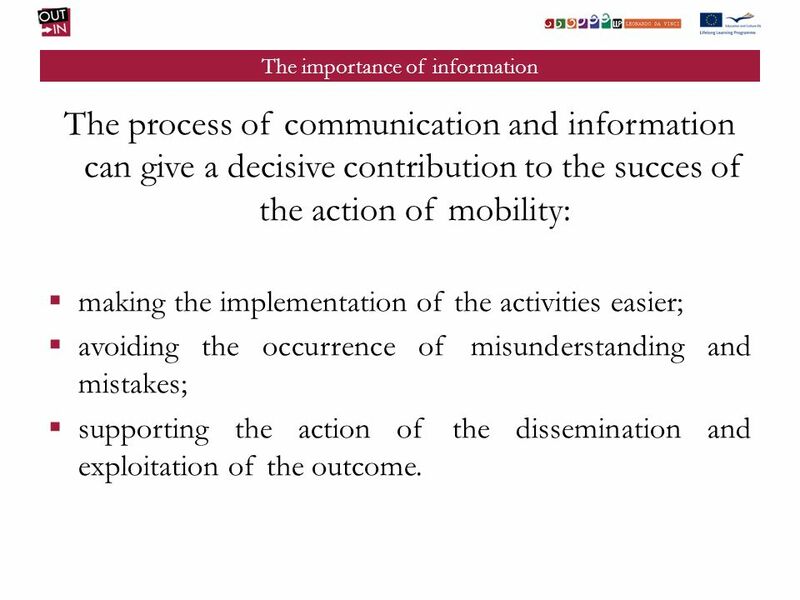 2 The importance of information The process of communication and information can give a decisive contribution to the succes of the action of mobility: making the implementation of the activities easier; avoiding the occurrence of misunderstanding and mistakes; supporting the action of the dissemination and exploitation of the outcome. 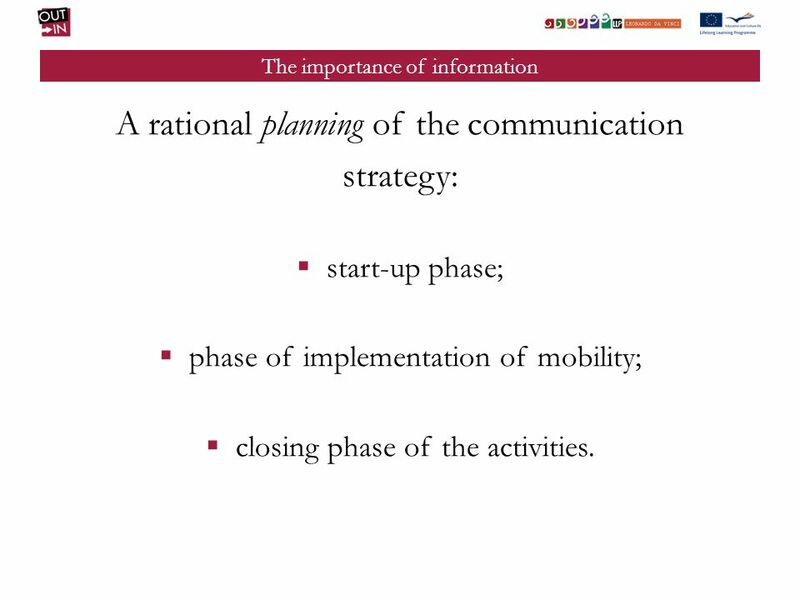 3 The importance of information A rational planning of the communication strategy: start-up phase; phase of implementation of mobility; closing phase of the activities. 4 The importance of information START-UP PHASE In this phase the information actions have the purpose to sensitize the territory and the prospective recipients about the mobility project and its objectives. The information given by the partnership web must be practical and must be based on the actual characteristics of the training. 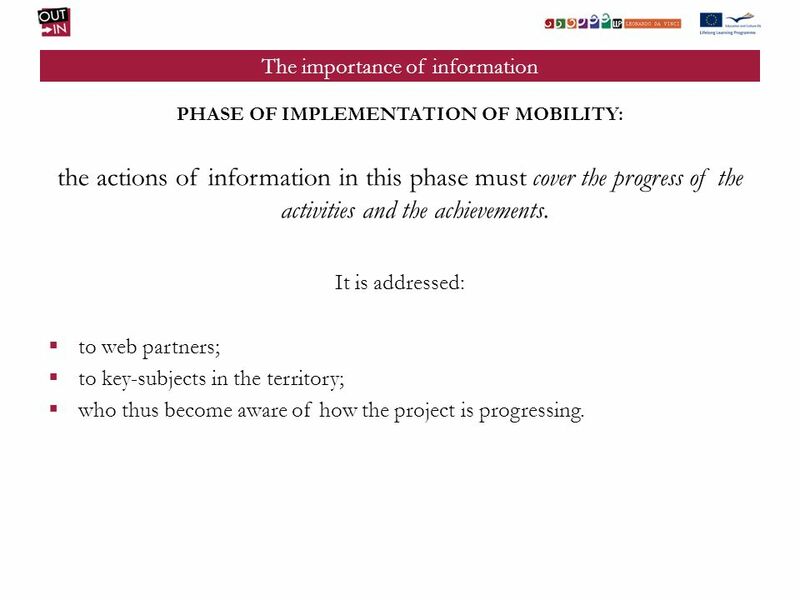 5 The importance of information PHASE OF IMPLEMENTATION OF MOBILITY: the actions of information in this phase must cover the progress of the activities and the achievements. It is addressed: to web partners; to key-subjects in the territory; who thus become aware of how the project is progressing. 6 The importance of information CLOSING PHASE OF THE ACTIVITIES: the information actions of this phase have the purpose to support the dissemination of the results and their exploitation. The comunication takes: inside the partnership; to expound the results with the people who have moved and give information on the impact on the area. 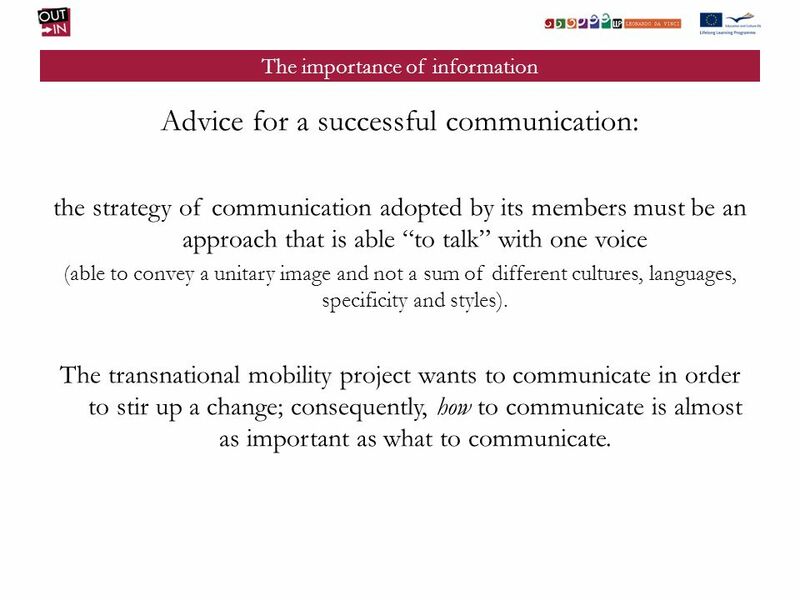 7 The importance of information Advice for a successful communication: the strategy of communication adopted by its members must be an approach that is able to talk with one voice (able to convey a unitary image and not a sum of different cultures, languages, specificity and styles). The transnational mobility project wants to communicate in order to stir up a change; consequently, how to communicate is almost as important as what to communicate. 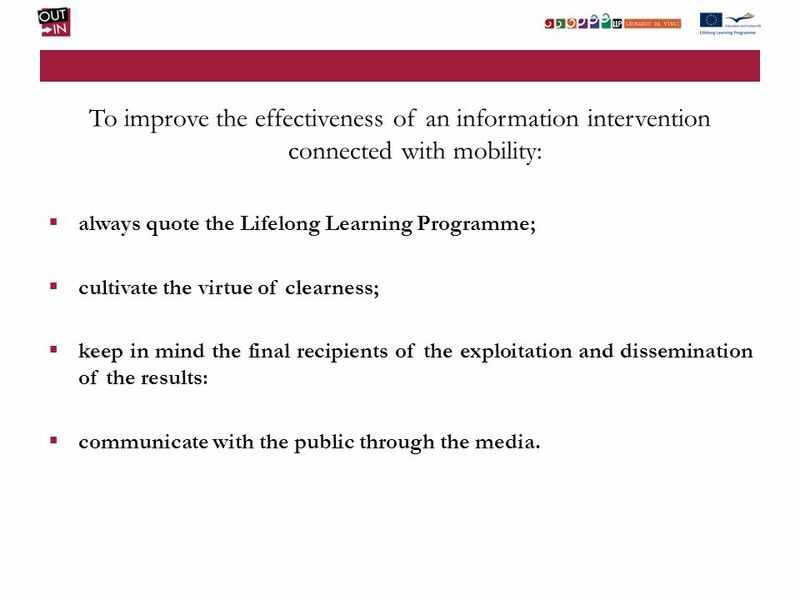 8 To improve the effectiveness of an information intervention connected with mobility: always quote the Lifelong Learning Programme; cultivate the virtue of clearness; keep in mind the final recipients of the exploitation and dissemination of the results: communicate with the public through the media. 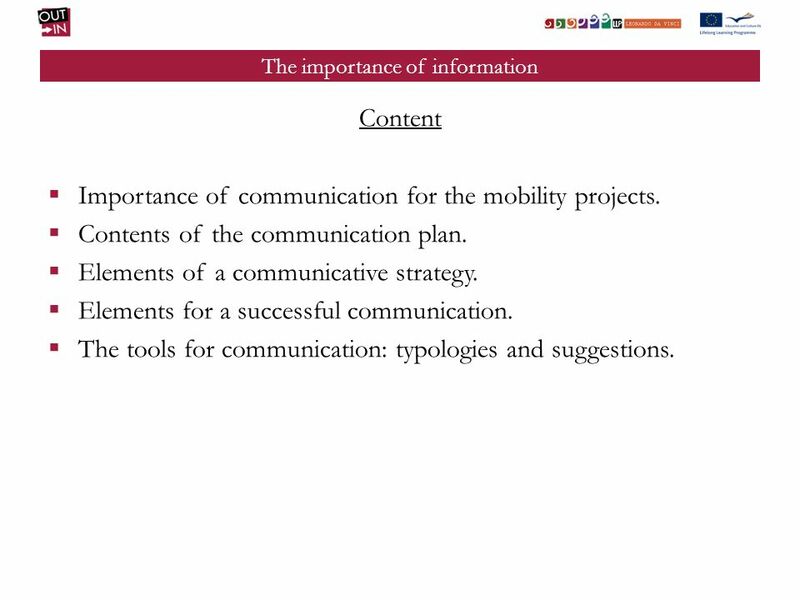 9 The importance of information Content Importance of communication for the mobility projects. Contents of the communication plan. Elements of a communicative strategy. Elements for a successful communication. The tools for communication: typologies and suggestions. Download ppt "THE IMPORTANCE OF INFORMATION Training unit 4.1 Objectives and channels of comunication." HOW TO EVALUATE A MOBILITY PROJECT Training Unit 11.1 Procedures, tools and roles for the evaluation of a mobility project. HOW TO DESIGN THE TRAINING CONTENT Training Unit 7.2 The fundamental elements of training contents. HOW TO FORM A PARTNERSHIP Training Unit 3.2 National, transnational and local networks. HOW TO DESIGN THE TRAINING CONTENT Training Unit 7.1 Standards for defining the training content. PREPARATORY ACTIVITIES Training Unit 6.1 Preparatory activities before the placement. HOW TO ORGANIZE THE MONITORING AND THE TUTORING Training unit 8.2 How to monitor the training. REALISING THE SELECTION Training unit 5.1 Preparation of the selection: announcement, information and sensitization. The Adult UK sight loss pathway and the role of the local society Jenny Pearce Chair of VISION 2020 Rehab and Low Vision Group and Trustee of Thomas Pocklington. Team Communication What does it take?. Overview  Why it is important & necessary  Creating Team Communication  Characteristics of Open Communication. PARENT VOICE. What is Parent Voice?  Parent Voice is a group of parents, representing parents, run by parents with the support of the school.  Parent. HM Inspectorate of Education 1 The Quality Framework for Scottish FE Colleges Angus Allan, HMIE. Project Cycle Management for International Development Cooperation Communication Teacher Pietro Celotti Università degli Studi di Macerata 12 December. MASTER CURRICULUM DESIGN PROGRAMME - curriculum proposal of the University of Niš - TEMPUS IV MASTS 511170 Niš, 30 th November-1 th December 2011.